BANT has formally written to the Health & Care Professions Council (HCPC) requesting that the register of dietitians is modified to allow for the entry of nutritional therapists. This will require clarification from the HCPC over the applicable standards of proficiency for dietitians and what is legally required to demonstrate that applicants can meet those standards. We expect to write to the HCPC shortly to follow-up on these points after considering this matter further with our lawyers. We also understand that the matter will be discussed at the next HCPC Council meeting on 3 December. Members should also note that we have been in correspondence with the Privy Council on these points and we will keep members updated on developments. November’s BANT News is now live – packed with tips for members on how to boost their businesses over the festive period, important updates on professional practice and the latest CPD events. Access the BANT news here. This is the twenty first edition of our new look BANT News we hope you enjoy it. Deputy Chair of BANT, Sarah Green, says low carbohydrate diets should be the first treatment recommendation for diabetics. Registered Nutritional Therapists recommend lower carbohydrate diets. Just as we have “good fats and bad fats” we have good carbohydrates and bad carbohydrates. Green leafy and non starchy, colourful vegetables are good carbohydrates. But starchy vegetables, grains and wholegrains (found in bread, pasta, cereal, cakes etc) are bad carbohydrates if you are overweight or obese. As our food becomes ever more processed and modified and our lives become more stressful and sedentary, late onset diabetes is manifesting younger and younger. We need to fundamentally change our approach. Diabetes does not happen overnight. It happens over years of chronically raised blood sugar and insulin levels stemming from too much carbohydrate, increased stress levels, systemic inflammation and lack of exercise. Nutritional guidelines which persist touting low fat foods as healthy are encouraging people to eat more carbohydrates. If you lower the % of fat in the diet, the % of carbohydrate will automatically increase. The science shows that a balance of good fats are anti-inflammatory and that essential fats improve insulin sensitivity. Not promoting and supporting people to increase their intake of good fats, higher protein and reduce carbohydrates (along with stress management and increased exercise) is contributing to the underlying pathophysiology of type 2 diabetes. Until we start to use this knowledge in a preventative way, T2D is going to continue to plague us as one of the biggest epidemics of our time and worse contribute to the statistic that this generation of children will not outlive their parents. The lack of focus on prevention is costing the NHS and taxpayer dearly. BANT (The British Association for Applied Nutrition and Nutritional Therapy) comments on Fruit Juice as part of the 5 a day. 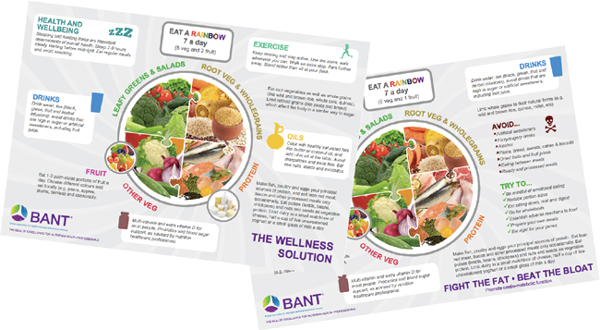 BANT supports the recommendation that fruit juice and smoothies should not be included as one of your five a day. Registered Nutritional Therapists have long advocated that extracted fruit juices and processed, concentrated fruit bars, should not be included in the 5 day. The five a day message came from the World Health Organisation’s report that increasing fruit and vegetable intake reduces the risk of chronic diseases like cancer and heart disease. These health gains are linked to the synergies that come from eating whole fruits and vegetables. Colourful fruits are packed with vitamins, minerals and importantly fibre, but processing quickly destroy those, leaving you with flavoured, sweet sugar water. The significance of high levels of sugar including fruit sugar on weight gain, diabetes and cardiovascular disease are well documented. Fruit juice is refined and the concentrated amounts of sugar in fruit juice, without any of the “fill you up” fibre, significantly increases sugar intake. A litre of orange juice has the sugar of 14-17 oranges (20 or so teaspoons). This is not about calories, it’s about the body’s physiological response to sugar which causes people to store fat. The research behind the 5 a day message is based on the intake of whole fruits and vegetables and in reality should focussed on eating more vegetables than fruits because of the higher sugar content of fruit. In an effort to reach 5 a day targets, fruit juices and smoothies, have been accepted as a convenient way to achieve the target, though the objective (better health) is missed because the nutritional value of the product has been diminished by the processing. People are confused by labelling which requires them to differentiate between juice and smoothies and high sugar fruit bars, when none of them should be included in the 5 a day.